Sometimes you just want to get busy and so something not ham radio related. Yes even me, something not ham radio. Two years ago I wanted to do some welding with leftover scrap metal and finally end up with something useful. So I made a mobile stand carrying two cheap 20W LED floodlights hanging two meters high. I mounted these so they could swivel around. That’s handy when I had to do something outside in the dark. The next level was hooking them up to a motion detector. Since that day all that moves outside triggers these flood lights so the bigger part of the garden bathes in light. Unfortunately these LED’s also trigger a major QRM source. 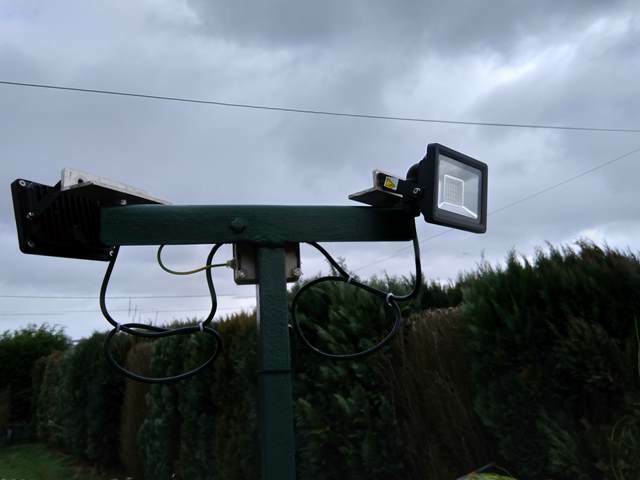 The floodlights wipe out everything on HF with an extremely broadband S6 level QRM or more. I learned to live with this and just cut the power to the motion detector when I’m in the shack. Sometimes I forget this prior to being active but as soon as the gray line is upon me and the dog wiggles its tail on the terrace, I’m brutally reminded that I need to cut the power to the LED lights. When in the middle of a decent run I text the XYL to do that for me ASAP. She is familiar with the routine by now. All this nuisance is not a biggie since it’s my stuff on my property and I’m in control. What if one of the neighbors installs this kind of crap? Cheap crap, I admit. The cheapest I could buy back then. That threat has been on my mind for two years now. I just hope since my closest neighbors are 40-50m away, the possible QRM will not affect me. My lights are right under all my antennas and the power cable crosses all coax and elevated radials. 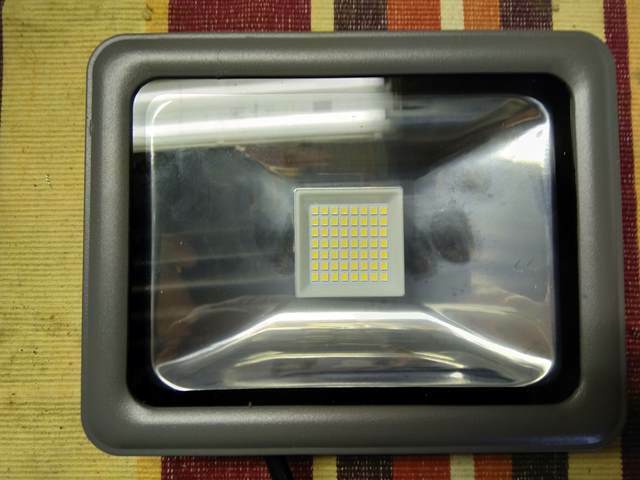 Last year I bought another flood light to replace a broken and soaked halogen light outside. It was only last week I got around unpacking it. Note: ‘last week’ was early December 2018; I haven’t had the time to finish writing this. I hooked it up to a remote RF switched AC power outlet and went into the shack. While listening I could turn it on and off with the RF RC. This one has ZERO impact on HF. At least not on the few samples spots on each HF band that I listened to. GREAT! New model = good model = no QRM. Notice the distinct LEDs i.s.o. one big yellow blob. 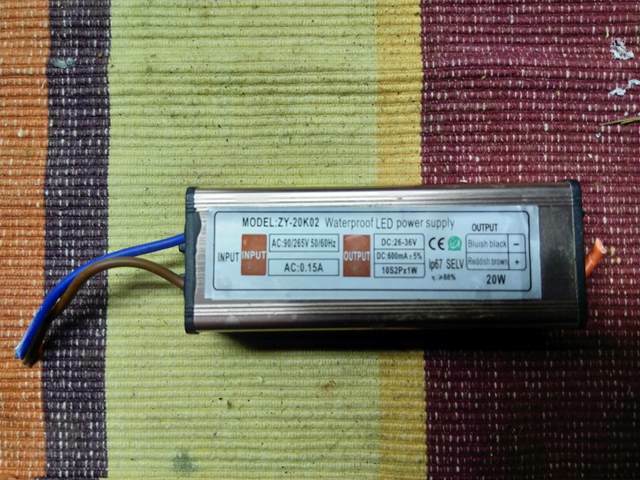 Today (again: in fact a few months ago) I bought a bigger 50W model of the same brand to replace the two 20W QRM sources. This one has zero effect on HF either. GREAT! 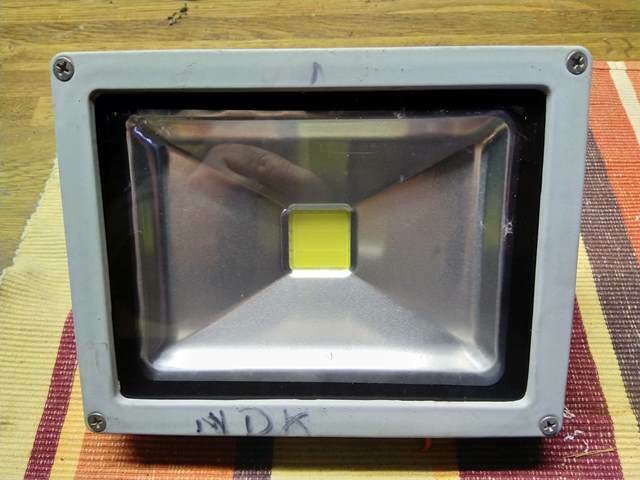 I guess I’ll retire the QRM LED floodlights for permanent motion trigger lighting. And hook up the non-QRM module to light up when there’s movement. New 20W model free of QRM on HF. Again: the box says ‘driverless’ and it shows many little LEDs and not one big module. The visible difference that caught my eye between the QRM and non-QRM versions: the bad model generating broadband RF noise has one big solid yellow LED capsule. Both EMC-proof models show a matrix with distinct LEDs. Furthermore the good models without QRM are marked ‘driverless’. Could that be the problem / solution? Could it be that the older models are with a switching driver module designed to put out broadband RF and power some LEDs while at it? And that the lack of driver in the other models explains the lack of QRM? In January 2019 one of both noise generators died. 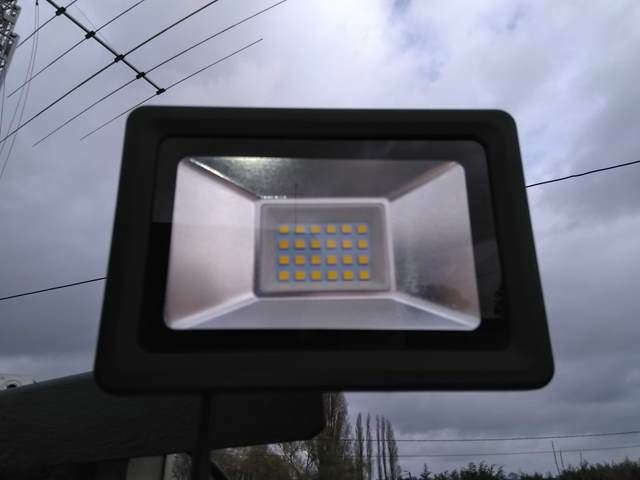 I replaced both the troublesome LED floodlights with the non-polluting types. Since then I did two contests with the motion detector active and experienced zero noise on HF. I opened up the defective light and found this part that I assume is ‘the driver’ as it sits between 230V AC and the DC-fed LED module. As quick search revealed that you can buy these things. Mostly from cave in Youknowwhere. I removed the driver module which has a label that says “26-36V DC output”. I hooked the LED light up to a DC power supply giving 27V but not a blink. So maybe it’s the LED module that is broken? It has been delivered to the recycling park by now. Very interesting stuff. Especially the last picture. Criminals! We really should stop buying this totally worthless garbage. But the whole EU market has been flooded with this kind of mis-engineered and ill-fabricated junk imported straight from Youknowwhere. It’s so cheap and we’re all penny-wise and pound-foolish.